Notice : Requires the base game Fallout 4 in order to play. Activation key must be used on a valid Steam account, requires internet connection. 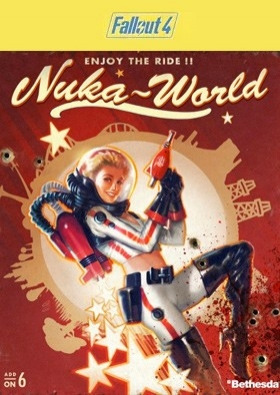 ABOUT THE GAMETake a trip to Nuka-World, a vast amusement park now a lawless city of Raiders. Explore an all-new region with an open wasteland and park zones like Safari Adventure, Dry Rock Gulch, Kiddie Kingdom, and the Galactic Zone. Lead lethal gangs of… Raiders and use them to conquer settlements, bending the Commonwealth to your will. Nuka-World features new quests, Raiders, weapons, creatures, and more. Enjoy the ride! SYSTEM REQUIREMENTS Minimum : OS: Windows 7/8/10 (64-bit OS required) Processor: Intel Core i5-2300 2.8 GHz/AMD Phenom II X4 945 3.0 GHz or equivalent RAM: 8 GB RAM Hard disk: 30 GB free HDD space Video card: NVIDIA GTX 550 Ti 2GB/AMD Radeon HD 7870 2GB or equivalent Recommended : OS: Windows 7/8/10 (64-bit OS required) Processor: Intel Core i7 4790 3.6 GHz/AMD FX-9590 4.7 GHz or equivalent RAM: 8 GB RAM Hard disk: 30 GB free HDD space Video card: NVIDIA GTX 780 3GB/AMD Radeon R9 290X 4GB or equivalent © 2016 Bethesda Softworks LLC, a ZeniMax Media company. Bethesda, Bethesda Softworks, Bethesda Game Studios, ZeniMax, Pip-Boy, Vault-Tec and related logos are registered trademarks or trademarks of ZeniMax Media Inc. in the U.S. and/or other countries. Fallout, Vault Boy and related logos are trademarks or registered trademarks of Bethesda Softworks LLC in the U.S. and/or other countries. All Rights Reserved.